Review published in IJPE, Vol. 8, No. 3, May 2012, p. 248. Requirements, published by Wiley in 2005. This is book is different from other books dealing with conventional reliability analysis and design as its premise is based on the cost of failures. This will result in a situation where even identical components may be designed to different reliability levels if their failure results in different losses. The author justifies this as risk –based reliability design and feels that a number of failures resulting in very high consequences can be avoided by following the formulated design principle if the reliability level to which a critical system is built, is derived from the consequences of its failures. An aggregated risk measure based on cumulative distribution of potential losses is introduced and theoretical framework for risk analysis based on the concept of potential losses is developed. In traditional analysis, losses from failures are calculated by average unavailability or availability. In the author's proposition, two systems with the same unavailability may have very different losses from failure depending upon the time of occurrences of the failures besides the average availability does not reveal the variation of actual availability and thereby the variation of losses. 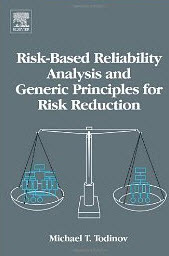 The book also addresses the problem of risk-based reliability allocation in a complex system. In the latter part, the book also provides generic principles and techniques for reducing risk of failure, which are classified in three categories, viz., reducing the likelihood of failure (what the author calls it as preventive), reducing the consequences of failure (protective) and the third category comprises reducing both, i.e., likelihood and consequences of failures. In fact the author claims that such a systematic presentation of risk reducing approaches has been done for the first time through this book. The author also supplements the book by providing a review of classical reliability and risk analysis techniques and models. The referee finds this book quite interesting and recommends to the students of reliability and researchers to have a closer look at it so that further research can be initiated to develop tools hitherto were not possible and a realist approach to risk-based reliability design of systems is possible. This book should be a good addition to a library of books on reliability and risk. Review published in the International Journal of Performability Engineering, Vol. 8, No. 3, May 2012, p. 248..